Spray Lake Sawmills (SLS) and Sustainable Resource Development (SRD) are hosting a “community information session” on Thursday, Nov 18, 3:00–8:00 p.m., at the Heritage Inn in Pincher Creek. 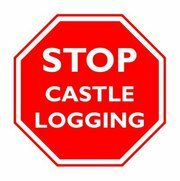 This is a good opportunity for all of us to get out and let SLS and SRD know that there shouldn’t be any logging in the Castle at all! We’re hoping for an impressive crowd and, to do that, we’re suggesting that people arrive around 5:00 p.m. if possible. This will also make it more difficult for SLS and SRD to “divide and conquer” the crowd. On December 7, the Southwest Alberta Sustainable Community Iniative (SASCI) will be following-up with a session titled “Forest Management and Logging, A Community Conversation”, also in Pincher Creek. There will be a Poster Session, Presentations, and a Moderated Question and Answer Session. See SASCI’s website for more information, http://www.sasci.ca/upcoming-events/. You are currently browsing the Stop Castle Logging blog archives for November, 2010.